Although technological changes and a rise in travel opportunities are good things, the possibilities of information being lost, stolen, or attacked come with the territory. You’ve probably come across articles addressing these issues with travel tips to help your business travels run smoothly. Most people (myself included) might do a quick scan, take note of something relevant, and disregard the rest. However, there’s a reason these tips get posted often. While it’s true that some tips are obvious, there are some that you should stop ignoring. This is especially important given the US government shut down and the potential for delays and problems being higher than they normally would be. No matter how much we plan, things aren’t always guaranteed to go accordingly. Therefore, it’s important to prepare for the worst case scenario. Here are five travel tips that you probably ignore but shouldn’t. 1. Make a copy of important documents. No matter how much we plan, unexpected events will happen at some point or another. These events can be especially challenging when they involve documents such as your passport, driver’s license, or visa if your business trip requires it. If you lose any of these documents or they get stolen and you don’t have a backup in place, you’ll have an extra layer of stress and problems added to your trip that you really could’ve gone without. While you’ve likely heard this tip before, taking the time to copy your documents and storing them somewhere safe online is worth it. Store them in your email, on a cloud-based service, and with family so that they are easily accessible. As someone who had their credit card hacked while abroad, having a copy of all the information from the credit card stored help me handle the situation much more efficiently. This is one of those tips that once done, you won’t have to worry about again until your information changes or documents get renewed. 2. Learn your destination’s local emergency number. We all know that 911 is the go-to emergency number in the United States. However, besides a few other countries like Canada and Argentina, dialing 911 in other countries will not put you across to their emergency department. Even then, some countries don’t use the same number to reach the local police, ambulance, or fire department. Being aware of the different numbers while traveling is never a bad idea. No matter how alert and aware you are, things can always go wrong. Keep a note saved in your wallet and on your phone with useful numbers, just in case. 3. Leave a copy of your itinerary with someone you trust. I can’t stress this enough – always leave a copy of your itinerary with a loved one. This goes without saying, but if something was to happen to you, it’ll give them a place to start looking. Plus, it will help you keep organized and keep track of your business activities. Travel insurance is something that I consider a necessity, especially when traveling abroad. Yes, it does add extra money you need to spend on a trip. But compared to the amount it’ll save you if you do end up in a situation where it’s needed, buying travel insurance is worth it. Since most travel insurances cover things like cancellation, delay, lost baggage, and medical coverage, you’ll be glad you don’t have to worry about that. Additionally, if you use your credit card to book your travels, you may also have coverage from that. It’s a good idea to read up on your policy before you travel. 5. Sign up for alerts from the State Department. Though many people prefer to avoid thinking about it (especially if they’re already a nervous traveler), there are possibilities of coming in contact with a terrorist attack, political violence, or even a natural disaster while traveling. If you are traveling abroad, I recommend checking the State Department’s website to see if there are any specific risks you should be aware of. I also recommend signing up for the State Department’s Safe Traveler Enrollment Program (STEP) so if a crisis does occur while you’re abroad, the U.S Embassy will contact you and help you through it. If you have social media, consider following or at least being aware of relevant accounts that will post any information you might need when traveling. For instance, you can often reach representatives and get updates through Twitter. Though these five tips might require some time and research, they are worth doing. Being prepared and having friends and family in the loop can make a significant difference should something happen. It is always better to be prepared. Really, it was only a matter of time before somebody thought to combine today’s hottest transportation trends: shared electric scooters and autonomous driving. Over the weekend, Uber reportedly unveiled a micromobility robotics division at a robotics meetup in the Bay Area. Though the company declined to confirm or comment on the new addition, the division will reportedly explore how to make the scooters and shared bikes it’s now deploying alongside its cars capable of riding themselves. The key questions, then, are the classic ones—why and how. The “why” makes, well, a touch of sense. Self-driving e-scooters and bikes would be able to mosey themselves over to battery-charging stations, or wheel themselves into maintenance depots, or redistribute themselves to exactly where users need them to be. That would be helpful, because operations and logistics can be an pricey pain for tech-enabled scooter- and bike-share companies. Figuring out where and when scooters need to be deployed, and when and how they need to be charged and repaired, is hard enough. But getting human beings out into the field, and doing the actual work of collecting, charging, and maintaining the vehicles has proven costly for the companies. According to investor documents provided to The Information showing internal company numbers from last spring, the e-scoot company Bird spent almost half its gross revenue per ride paying individual contract workers to charge their scooters, and another 14 percent of gross revenue per ride to repair them. So yes, it would save companies a tidy sum if they could cut human labor out of the picture. “Operating expenses are the biggest thorn in the side of the companies,” says Richard Branning, the CEO and founder of the startup Sweep, which provides operations and logistical services to scooter firms. (Sweep runs operations for Spin, the scooter startup acquired by Ford last year.) But he argues that even the most advanced robots might not be able to extricate themselves from the pinches that shared bikes and scooters can get themselves into. “Let me know when a scooter is behind a fence and there’s a dog biting at it, when it can hop that 10-foot fence and get back on the road and zoom itself back to a charging pod,” he adds. Indeed, making anything drive itself in the real world is really hard. Beyond a few demo rides, no company has been willing to take the human safety operator out of its cars, which is another way of saying that nobody has cracked the self-driving problem yet. And while scooters and bikes don’t match the speed or weight—and thus the potential danger—of cars, they bring their own challenges. First, these are two-wheeled vehicles, and they tend to fall over when they don’t have a human using their weight and movement to keep them upright. Beyond adding extra wheels or heavy, complex tech like a gyroscope, there’s no obvious way to ensure they don’t tip, or to get them back up off the ground when they do. 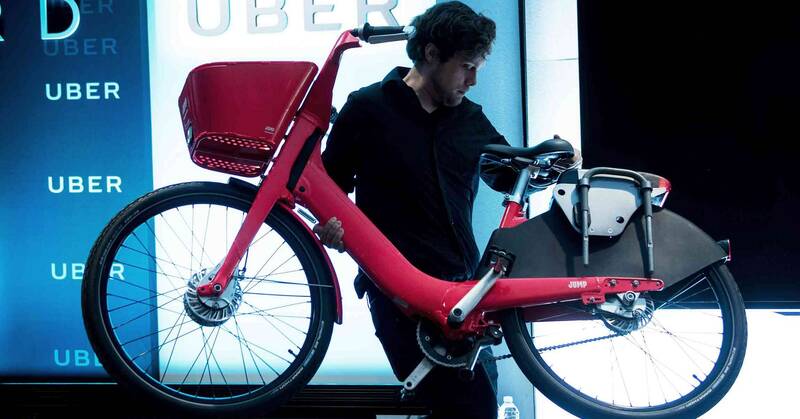 It’s not clear how to make a bike propel itself at all, since the e-bikes that Uber’s mobility subsidiary Jump and its peers use are pedal-assist: They augment foot power with motors, but those alone aren’t powerful enough to move the whole bike. Second, scooters will have to operate on the sidewalk or on the street. That means they’ll have to deal with vehicles, intersections, and walking humans. Maybe even the occasional rogue squirrel. That stuff is hard, but achievable, according to Kevin Peterson, the CTO of sidewalk delivery-robot company Marble. The bigger hurdle he sees is cost. Any self-driving vehicle needs sensors to perceive the world and computers to turn that data into decisions about how to move. Even if you manage to do this without lidar—which is the most expensive sort of sensor and costs in the thousands-of-dollars range—and use a combo of sensors and computer vision techniques instead, you’re making the vehicle more expensive.“I don’t know of a safe autonomy system that would be cheap enough to put on a scooter,” Peterson says, suggesting an ambitious $50 as a ceiling. Trouble is, a key advantage of bikes and scooters is that they are cheap, around $500 per scooter. And these shared vehicles live outside and take a beating—even when people aren’t hurling them into local bodies of water or stuffing them up into trees. On top of the cost of the system, Uber would have to put more money into hardening an expensive sensor and computing suite, or replace the scooters’ and bikes’ cameras and other bits more often than they’d like. OK, so coaxing scooters and bikes to drive themselves would be very difficult and very expensive. The undertaking is still somewhat on brand for Uber. CEO Dara Khosrowshahi has positioned the company as the “Amazon of transportation.” He wants Uber to be able to get you anywhere, and bring you any meal, no matter your travel mode. He also has decided against nixing the company’s expensive self-driving research and development efforts—Uber wants autonomy to be part of its very long term future. As the company gears up for its initial public offering this year, of course self-driving scooters and bikes will be part of its narrative. BEIJING (Reuters) – Tesla Inc (TSLA.O) has signed a preliminary agreement with China’s Tianjin Lishen to supply batteries for its new Shanghai car factory, as it aims to cut its reliance on Japan’s Panasonic (6752.T), two sources with direct knowledge of the matter said. While Panasonic is currently Tesla’s exclusive battery cell supplier, Tesla Chief Executive Elon Musk said in November the U.S. company would manufacture all its battery modules and packs at the Shanghai factory and planned to diversify its sources. “Cell production will be sourced locally, most likely from several companies (incl Pana), in order to meet demand in a timely manner,” Musk said in a tweet in November. Other battery makers in the running for contracts could include Contemporary Amperex Technology Co Ltd (300750.SZ) and LG Chem Ltd (051910.KS). Musk has said the factory will produce “more affordable” vehicles for the Chinese auto market, the world’s biggest, where the firm is facing mounting competition and risks from U.S.-China trade tensions. Panasonic said in a statement it was studying various possibilities with regards to Tesla’s Shanghai plant, but nothing had been decided. It declined to comment on the possibility of losing exclusive-supplier status with Tesla. Lishen, which says its clients range from Apple (AAPL.O) and Samsung Electronics (005930.KS) to Geely (0175.HK) and Hyundai Motor (005380.KS), has joined other battery makers in aggressively pursuing contracts with the rapidly growing EV industry. The Chinese company started mass production of the same type of cylindrical battery made by Panasonic for Tesla’s Model 3 in 2017, in the city of Suzhou about 100 kms (60 miles) away from Shanghai. Reuters reported on Monday that Panasonic and Toyota Motor Corp (7203.T) were set to launch a joint venture next year to produce EV batteries in an effort to compete with Chinese rivals. It would also help Panasonic cut its heavy reliance on Tesla, whose production delays have weighed on the Japanese company’s earnings. SAO PAULO (Reuters) – Amazon.com Inc is launching its long-awaited in-house fulfillment and delivery network in Brazil after months of delays caused by complicated logistics and a highly complex tax system in the largest Latin American economy. “We are launching (our direct sales platform) with 320,000 different products in stock, including 200,000 books… Our obsession is always to increase this catalog and to have everything Brazilian consumers seek and want to buy on the internet”, Amazon’s Brazilian country manager Alex Szapiro told Reuters. “As in every negotiation, you take a seat at a table and you want to agree on the best possible terms”, said Szapiro when asked on the tone of conversations with suppliers, without entering in details. Even though the bank predicted Amazon would take a “gradual approach” and was likely to vye for a “low double-digit market share,” shares of Brazilian retailers reacted negatively to BTG’s report, with B2W, Magazine Luiza e Lojas Americanas among the biggest losers in Monday’s session.